FOXBORO, MA - DECEMBER 8: Josh Gordon #12 of the Cleveland Browns catches a pass before a game with the New England Patriots at Gillette Stadium on December 8, 2013 in Foxboro, Massachusetts. BEREA, Ohio (AP) — Josh Gordon’s season went beyond what he or anyone else expected. Way beyond. The second-year wide receiver has broken Browns records, set league marks and evolved into one of the game’s top playmakers. And, he’s done it despite being suspended for two games. Next year, he has even higher goals. "Hands down, just be outright the best wide receiver in the NFL," he said. Ward headed to Pro Bowl? 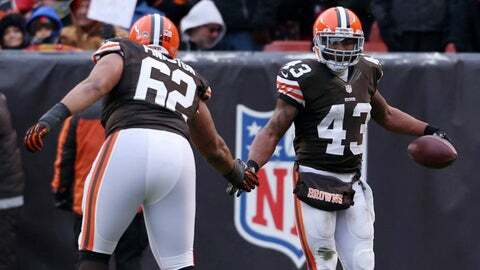 On Thursday, Gordon was unanimously voted Cleveland’s MVP for 2013 by the local chapter of the Pro Football Writers Association. Gordon wrapped up his victory weeks ago, when he went on a four-game tear unlike any the league has ever seen. He rewrote the record books, becoming the first player to top 200 yards receiving in consecutive games, totaled 649 yards in three games and racked up 774 yards in four. He turned short catches into long gains. 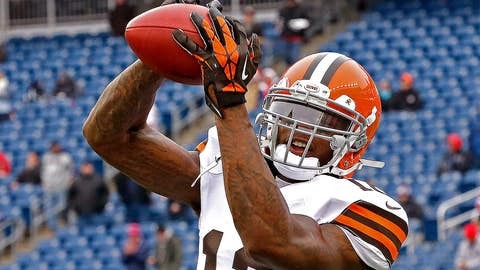 He dominated highly regarded New England cornerback Aqib Talib, and the 6-foot-3, 225-pounder gave Cleveland fans a reason to watch the Browns, who fell apart following a 4-5 start and enter the season finale against Pittsburgh on a six-game losing streak and with nine losses in 10 games. "I think I did pretty well, considering the circumstances and what I wanted to get done," he said. "I think I met every expectation I could have had. Maybe I could have made a few more plays here or there, little things. I think I did all right." With 1,564 yards, Gordon enters the weekend leading Detroit’s Calvin Johnson (1,492) for the league lead. No Cleveland player has ever finished the season on top, and Gordon, averaging 120.3 yards per game and 19.6 yards per catch, would like to add that his growing resume — along with a Pro Bowl trip. But despite his brilliance, Gordon hasn’t been perfect. By his lofty standards, Gordon’s past two games have been pedestrian. He had just 67 yards — all in the second half — in a loss to Chicago two weeks ago. Last week against the New York Jets, Gordon dropped two passes, one on a fade pattern in the end zone that cost the Browns a touchdown. The lapses stood out because Gordon has been so dependable, so dominant. He, too, was puzzled and disappointed by his performances. "I want to do the best that I can do and I never want to let anyone down and miss a play," he said. "I always want to make a play and be a guy that can be relied upon. It seems as though I’ve missed a few plays the past few games and it seemed out of character for me. I can’t really say what it was." Gordon acknowledged he may have been pressing, trying to make big plays and losing focus. He’s only 22 and still learning that consistency is the key to greatness. "He’s still a receiver that’s learning on the go," Browns quarterback Jason Campbell said. "He’s had some outstanding games this year. There’s still some things he can continue to keep working on, continue to keep improving and really the sky’s the limit for a guy like him." Campbell said he spoke to Gordon about last week’s game and urged him to put it behind him. "I said, `Every player has those games, you just can’t get stuck on it,’" Campbell said. ‘"Bounce back this week and go out and perform in practice and move on and just challenge yourself to be that elite receiver that you want to be.’"
Gordon understands he’s a work in progress. "I’m glad where I’m at right now," he said, "but I think I could always do a lot better." NOTES: Browns CB Joe Haden (hip) was on the practice field, but did not take part in any drills during the portion open to media members. TE Jordan Cameron (concussion), S T.J. Ward (shoulder), NT Phil Taylor (concussion), DE John Hughes (knee), G Jason Pinkston (concussion) and G Shawn Lauvao (thigh) sat out. Ward was a new addition to the injury report. He practiced on Wednesday. … Defensive coordinator Ray Horton accepted some blame for his unit’s fourth-quarter failures, saying he "didn’t get guys to finish." Horton, who interviewed for head coaching vacancies in Cleveland and Arizona last offseason, wants to return for a second year with the Browns. "I hope I’m back," he said. "I hope they don’t fire me."